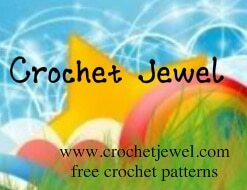 Here is a free crochet pattern from Amy, owner of Crochet Jewel. Amy is a talented crochet designer and she offers many free patterns at her blog. Among her many patterns she has a whole collection of animal and other fun hats for both children and adults. So why not check out her blog and subscribe so you can be notified of any new patterns. You can also join her on her Facebook page. Thank you Amy for allowing me to publish your pattern. You might also like this baby visor, which is available in baby, toddler and child sizes. 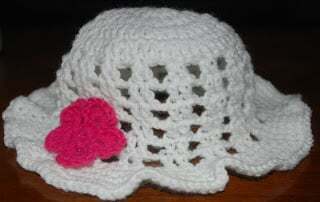 This white floppy sun hat is an easy crochet hat pattern that will look cute on your little one. I was inspired to make this floppy sun hat for my infant daughter! I don’t want the sun in her eyes this summer. My daughter will look so cute wearing this floppy sun hat. This design that I create for this hat will keep the sun out of her eyes and give her shade. I made a little flower to give the floppy sun hat some flare and make it more girly! Rnd 13. *sc in the next 2 sc, 2sc in the next stitch, *Repeat sl st.
Rnd 14. *sc in the next 3 sc, 2sc in the next stitch, *Repeat sl st.
Rnd 15. *sc in the next 4 sc, 2sc in the next stitch, *Repeat sl st.
Rnd 16. *sc in the next 5 sc, 2sc in the next stitch, *Repeat sl st. fasten off. Pink yarn ch 5, join round with sl st.
Rnd 1. 10 sc in the loop, join with the beginning sc with a sl st.
Rnd 3. *sl sl in the chain 3 space, ch 1, work 6 dc in the chain space 3, ch 1, sl st. in the previous sc, *repeat until you have 5(6 pedals) sl st.
How to attach the flower to the hat??? I would take a matching piece of yarn and simply sew it on so it’s secure.